Just a mile from more than 5000 homes, the explosive fire is moving in multiple directions and has already swallowed 160 square miles. NBC's Miguel Almaguer reports from Hailey, Idaho. Officials battling a massive Idaho wildfire warned that thunderstorms forecast for Tuesday could trigger floods in the area already devastated by the "beast" of a blaze. “If a storm moves over the fire and dumps a lot of rain in a short amount of time then that could be a flood risk,” Blaine County officials tweeted. A huge aerial assault and favorable weather helped firefighters “make hay” against the fire threatening thousands of homes in central Idaho, including luxury celebrity getaways owned by Tom Hanks and Bruce Willis, authorities said Monday. If a storm moves over the fire and dumps a lot of rain in short amount of time then that could be a flood risk. The 1200 strong firefighting force, aided by the arrival of more crews from Louisiana, said they were making headway against the lightening sparked blaze, which has scorched more than 100,004 acres in 13 days. It remains around 8 percent contained, according to inciweb. “We made some hay today,” said John Kennedy, an operations branch chief on the fire around Hailey and south Ketchum, told the Idaho Statesman. This allowed the Blaine County Sheriff to lift pre-evacuation status for portions of Ketchum and Sun Valley from 5:30 p.m. local time (7:30 p.m. ET). 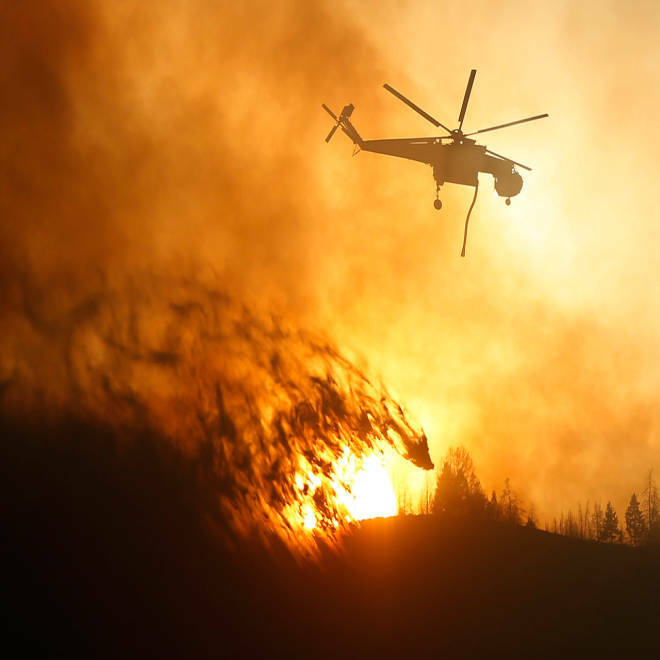 About 1,850 homes remained under a mandatory evacuation from the fire which has cost $9.3 million to date, according to the Twin Falls Times-News. At least 13 other large fires were burning Monday in Idaho, four of them in the same Sawtooth Wilderness area as the Beaver Creek Fire, the state Bureau of Homeland Security said. The largest, dubbed Little Queens, had spread to about 7,000 acres northwest of the tiny town of Atlanta, where the Elmore County Sheriff's Office ordered a mandatory evacuation Monday. "It's a little frightening, but you just take it in stride. It's been a dry, dry year," Evelyn Cramer one of several in the town’s 35 full-time residents who are evacuating, told KTVB. Elsewhere, the 131,000-acre Elk Complex Fire in Boise National Forest was being brought under control Monday, authorities said. The West has already suffered a series of destructive wildfires in 2013. Colorado experienced the most destructive wildfire in its history in June, which killed two and destroyed about 500 structures. As that fire burned, 11 other fires plagued the state, and more threatened other parts of the Southwest. The following month, 19 heavily trained Hotshot firefighters were killed in the Yarnell Hill wildfire in Arizona. Even amid the destruction, 2013 is shaping up to be below average in terms of the number wildfires and their size. According to the National Fire Information Center and the National Interagency Fire Center, 31,683 fires had burned 3.3 million acres this season through Sunday. That compares to a 10-year, year-to-date average of 52,700 fires and 5.4 million acres. Dry conditions fuel blazes in the U.S.